Next PostNext Deportment chairs – The original naughty step! People have always needed bedside tables … where else do you put your book and your glasses and, in the old days, your candle or oil lamp? 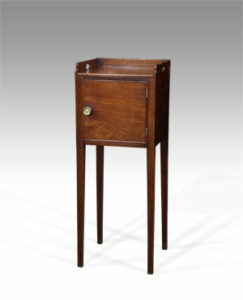 The very earliest type that we have in stock here at Thakeham Furniture date from the mid 18th century, and take the form of a tray top cabinet that concealed a commode in the base. Beautifully made, usually of mahogany, these pieces used the very best quality timber and were ‘fine’ pieces of furniture, as they would be displayed in the master bedroom. It is, unfortunately, very rare to find a true pair from this period – over the years they have been separated, or one damaged, and so on. But, although the different models vary – some have a tambour front, others a pair of doors – they were often very similar in size and shape. Once either side of a bed it’s not very easy to spot any differences … and that’s one of the things that is so special about antique furniture! 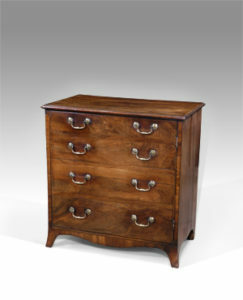 Another type of commode from this period is the sort that resembles a small chest of drawers. Usually converted to form either a cupboard or drawers, they make excellent bedside pieces with a height of around 30 inches. 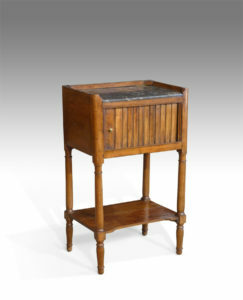 Later on in the Georgian period, bedside tables became smaller and simpler. 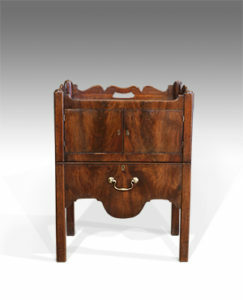 This model, dating from about 1800, with square tapered legs and a single cupboard [usually to hold a pot] was a popular, elegant style, usually in mahogany. Again, these are easy to find as a ‘matched’ pair. Another popular ‘bedside table’ model are these Georgian converted washstands; originally with a cut out in the top to hold a bowl, these have invariably had a ‘lid’ put on them at some stage to transform them into a simple, useful two tier table with a single drawer. They are nearly always roughly 12 inches wide and deep – so if you can find two the same height they will go together beautifully! We nearly always have two or three in stock. 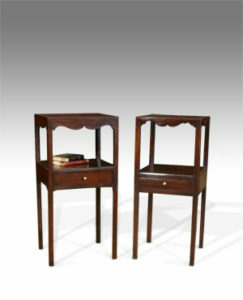 From the late 19th century it becomes possible to find pairs of bedside tables still in existence! Although sometimes not of such good quality, the late Victorian ones can be very pretty – particularly French pieces, such as this walnut pot cupboard with a marble top. We always carry a good selection here at the Thakeham Furniture showrooms, so do please drop in.